Type II and type III bursts are generated, via the plasma emission mechanism, when beams of suprathermal electrons interact with the ambient plasma generating radio emissions at the plasma frequency fp (the fundamental emission) or at its second harmonic 2fp (the harmonic emission) [see also previous CESRA highlights here and here]. As the electron beams propagate outward from the Sun, radio emissions are generated at progressively lower frequencies corresponding to a decreasing ambient solar wind plasma density. Type II bursts are generated by electron beams accelerated at the shock fronts driven by fast moving Interplanetary Coronal Mass Ejections (ICMEs), while type III bursts are a consequence of impulsively accelerated electrons associated with solar flares (Figure 1). We show an observation of an ICME erupted on the far side of the Sun from the Earth’s perspective on 2013 November 29 (Figure 2, Krupar et al., 2016). At the time of the event, the STEREO-A and STEREO-B spacecraft were 150◦ of heliocentric Earth equatorial (HEEQ) longitude ahead of and 147◦ behind of Earth, at heliocentric distances of 0.96 AU and 1.08 AU, respectively. SOHO was located some 1.5 million km upstream of the Earth. In this case, we have complimentary in situ measurements obtained by MESSENGER which was at an HEEQ longitude of 132◦ and a heliocentric distance of 0.40 AU. Figure 2. Coronagraph images on November 29, 2013. The radio location of the first interval of the type II radio burst are overlaid in the STEREO-A image (colors denote frequency as in Figure 4a). Locations of the two streamers are denoted by red arrows. Adapted from Krupar et al. (2016). This favorable configuration of SOHO and STEREO allows us to apply the graduated cylindrical shell (GCS; Thernisien et al., 2009) model to coronagraph images simultaneously recorded by these three spacecraft in order to reconstruct the ICME leading edge in 3D. We performed this analysis using images taken between 20:00 UT and 23:30 UT on November 29, when the ICME was well observed by all three spacecraft. From GCS fitting, we estimate the radial distance of the leading edge rGCS, leading to a calculated average ICME speed of 761 ± 13 km s−1. The ICME angular half-width λGCS was estimated to be 59◦. The HEEQ longitude of propagation of the ICME from GCS fitting was 128◦, which is roughly towards MESSENGER. To calculate the speed further out in the heliosphere, we also applied the self-similar expansion fitting (SSEF) technique to STEREO-A/HI data (Davies et al., 2012). Using λGCS as input, SSEF yielded a ICME radial speed of 862 ± 8 km s−1, and a HEEQ propagation longitude of 135◦. These values are in very good agreement with those from the GCS fit. The ICME was accompanied by interplanetary type II and type III bursts detected by both STEREO spacecraft on November 29 – 30, 2013 (Figure 3). Since the ICME was launched from the far side of the Sun, ground-based high frequency radio measurements of the associated radio bursts are absent. Figures 3a and 3b display the radio flux density S measured by STEREO-A and STEREO-B, respectively. The type III burst at 22:00 UT on November 29 is followed by the intermittent type II burst, over an interval of seven hours. Figure 3. From 22:00 UT on November 29, 2013 to 05:00 UT on November 30, 2013: Panels a) and b) the flux density SA and SB. Solid and dashed lines denote results of the GCS model assuming emission at the leading edge and flanks, respectively. Adapted from Krupar et al. (2016). Within this, we were able to identify three intervals when the signal at both spacecraft was intense enough to enable successful direction-finding analysis: at 22:30 UT (1,500 kHz) on November 29 and at 00:30 UT (600 kHz) and 04:00 UT (300 kHz) on the next day. To compare radio measurements with the ICME propagation parameters, we converted the radial distances yielded by the GCS fit rGCS to frequencies f using the density model of Sittler & Guhathakurta (1999) assuming the fundamental emission. We consider the type II burst to be generated at both the leading edge of the driven shock (f ∼ rGCS) and flanks (f ∼ rGCS cos λGCS). The type II burst coincides well with the kinematic curve which corresponds to ICME flanks. Although type II bursts are generated at interplanetary shock fronts of propagating ICMEs, they predominantly appear close to ICME flanks. At this time, the separation angle between the two STEREO spacecraft was 64◦ which allows us to accurately locate the sources of the type II and type III bursts by triangulation using direction-finding analysis. The triangulated type II and type III radio bursts are clustered along the ICME propagation direction that is predicted by the GCS and SSEF fits, with radial distances ranging from 0.12 AU to 0.31 AU (Figure 4a). We find that, for this interval, the radio sources are located considerably further from the Sun when compared to the density model of Sittler & Guhathakurta (1999), which predicts radial distances between 0.03 AU (1,500 kHz) and 0.10 AU (300 kHz). This ambiguity is probably caused by radio sources being spatially extended and/or radio propagation effects along with the simplicity of the solar wind density model employed. Figure 4. a) Radio source locations of type II (circles) and type III (squares) bursts for four time-frequency intervals in the XYHEEQ plane. Colors denote frequencies. The cyan and green arrows indicate the ICME propagation directions obtained by the GCS model and the SSEF technique, respectively. b) Positions of the spacecraft in the solar equatorial plane on 29 November 2013. The purple and black arrows indicate average directions of type II and type III bursts, respectively. c) Kinematics of the ICME leading edge and radio sources between 2013 November 29 and December 1. Dotted lines are linear fits. Adapted from Krupar et al. (2016). We have examined STEREO-A/SECCHI/COR2 images in order to compare the relative positions of the triangulated source locations of the first interval of the type II burst with coronal structures (Figure 2). 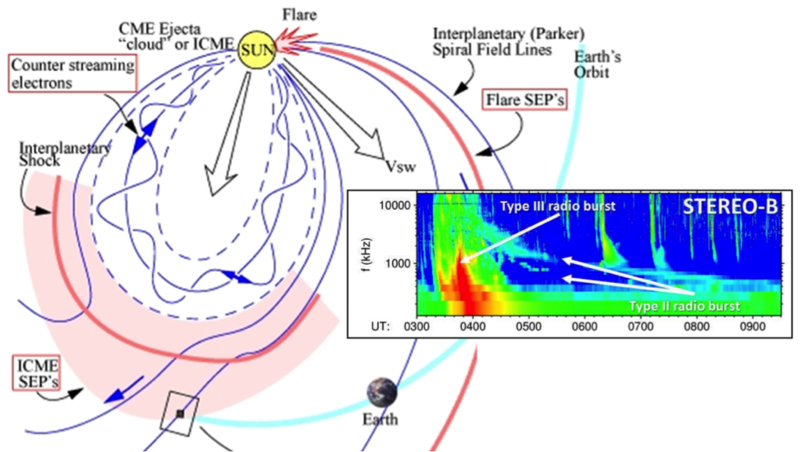 The type II burst sources are clustered along positions of two streamers located at the west limb and at the southern ICME flank (see red arrows in Figure 2). This suggests a close relationship between the type II burst and a possible interaction between the ICME-driven shock and these streamers. A fast forward interplanetary shock was observed by MESSENGER, at 0.4 AU on November 30 at around 14:30 UT, identified by a sharp increase in the magnetic field magnitude. Figure 4b shows an overview of the results obtained for the ICME and ICME-driven shock propagation. We have averaged azimuths φ of the type II and type III burst source locations from which we derive their propagation directions. Results for the propagation direction obtained for the type III burst are in a very good agreement with the results of GCS and SSEF fitting. Figure 4c displays kinematics of the ICME leading edge and radio sources. The results from the various techniques are in good agreement with the ICME-driven shock arrival times at MESSENGER and STEREO-A. For an analysis of the type II frequency drift, we converted frequencies of the type II burst f to radial distances r using the density model of Sittler & Guhathakurta (1999). As in Figure 2, we consider two possible scenarios: the emission originates at the ICME leading edge (r ∼ f) and flanks (r/cosλGCS ∼ f). A comparison with white-light and in situ measurements suggests that the latter is valid, and the derived average speed of the ICME-driven shock from a frequency drift is then 992 ± 22 km s−1, which is consistent with an assumption that the ICME-driven shock propagates faster than the ICME itself. This ICME would likely trigger a geomagnetic storm if Earth-directed and if it had large southward magnetic fields. We thus conclude that interplanetary radio emissions can provide us with an additional tool for predicting both ICME-driven shock speed (using a frequency drift of type II bursts) and direction (obtained by radio triangulation of type III bursts) with potential applications in space weather forecasting especially when combined with white-light coronagraph data. Currently, there are only two spacecraft in operation that carry coronagraphs (SOHO and STEREO-A) and our ability to obtain reliable estimates of the time of arrival of ICMEs and their shocks would be significantly curtailed if any one of them failed. We believe that the monitoring of ICME-driven shocks, from both a scientific and space weather perspective, would be enriched by the addition of space-borne radio instrumentation.